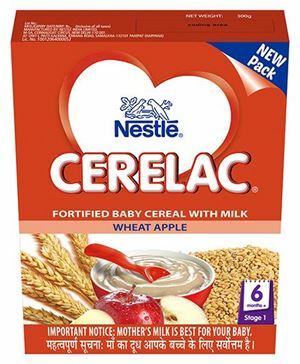 FEATURES: Nestl CERELAC is a complementary food intended for spoon feeding from 6 months. 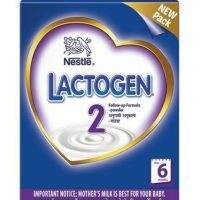 It should not be used as a breast milk substitute. For the first 6 months, the breastfeeding is mandatory. After 6 months, the introduction of solid food to the baby is essential and should not be delayed. 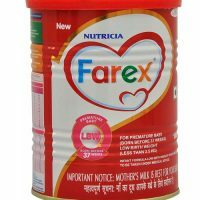 For the baby health, all the guidelines should be followed. CERELAC is suitable for Vegetarians. 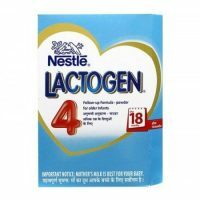 At the start of weaning use small quantities of Nestle CERELAC. The amount fed can vary according to your baby’s appetite. Increase portions as needed to a full serving of 50g of Nestl CERELAC powder mixed with 150ml of pre-boiled lukewarm drinking water. 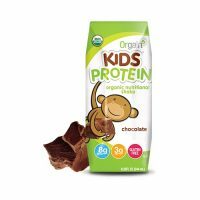 The product contains Cereals 49% (Whea flour, Hydrolysed wheat flour), Skimmed milk powder 23.7%, Dried apple 11.4% (Apple, Cornstarch, Maltodextrin, Emulsifier: Sunflower Lecithin), Vegetable oils (Palm, Rapeseed, Coconut, Sunflower), Maltodextrin, Minerals (Calcium carbonate, Ferrous Fumarate, Zinc sulphate, Potassium iodide), Vitamins (C, Niacin, E, B1, Calcium Pantothenate, A, B6, K, Folic acid, Biotin, D), Flavourings, Culture (Bifidobacterium lactis).